I am SO enjoying our garden this year! Last year we broke records for amount of rainfall.....rained for 6 weeks without a break...........was so soggy nearly nothing did well. This Spring has been very dry. We water the gardens and our 9 large and newly planted trees regularly, but do the minimum of lawn watering - you will see in the pics it has a nice golden dry hue to it. We have over 2 acres, and it wouldn't do to water it all during somewhat of a drought. They say it is better for lawn care to let it "rest" instead of only half watering. Today I am sharing a bouquet of freshly picked flowers from our gardens - some formal traditional, some grown in a wildflower garden section....but they play well together. 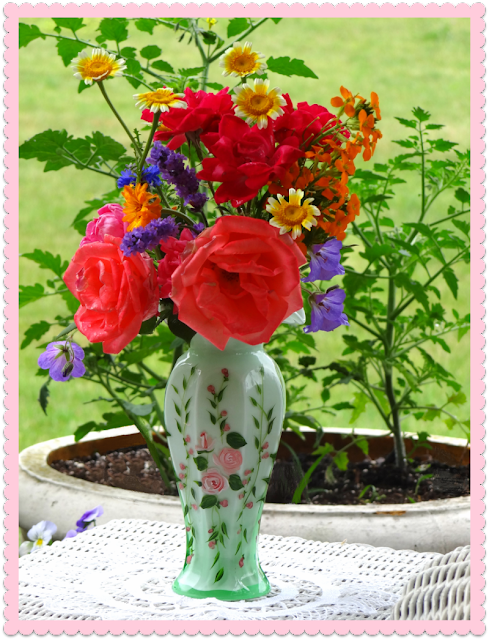 This hand painted roses vase is a recent thrifty find. It's green glass with a milky white interior. That is a large pot of tomato plants behind it. We only have a couple dime sized tomatoes on it so far. Such a bright day it hides the vintage doilie under that vase! The little wicker table was a thrifty score on the cheap! (You have seen it before.) I just love its versatilityand small size. Thanks to my DH things are lookin' pretty spiffy in this little space. I give you all my love! Your bouquet is magnificent ... & I love LOVE the wicker. This patio arrangement and photo of your garden is stunning Michelle. lovely roses, in the green glass vase. Here too I have to water. Summer has arrived so quickly. Its very hot. I am at the moment painting my wicker sofas for my patio.. I love yours.. Your bouquet is really beautiful! I love all the white wicker. We're having rain all the time. We had one storm this week that added 3 inches to my rain gauge. It must be nice to have a covered patio, Michele! Especially today with the heat we had! I finally went and checked out the condo pool today. I love your bouquet. It's even nicer when you know it came from your own yard. What a lovely bouquet! I love the vase. Perfect! Last year the hot dry weather and drought took a toll on everything around here. This season we have been blessed with more rain and everything is so pretty and green. The flowers have gone crazy. A pretty bouquet, Michele! I have nothing in my garden yet. It's been too cold. The crows bit off all my tulips so they didn't last long at all. There is a constant war going on here between my hubby and those black birds! That's what he gets for feeding them for so many years! Thank you for your visit and I hope you enjoy your weekend. Your patio looks so inviting! 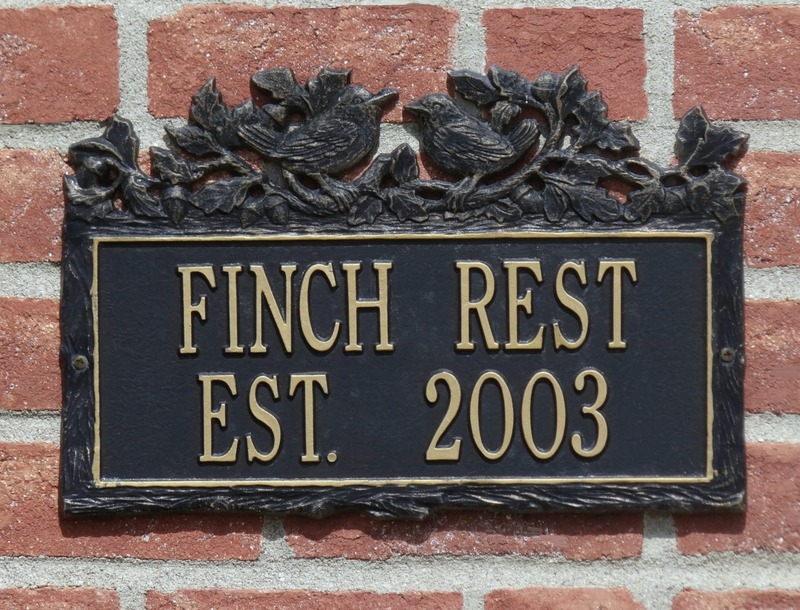 A perfect place to relax on a hot Summer day. The flower arrangement is really beautiful! The colors are so vivid. Lovely place to sit, have a cup of tea (or iced), read a book. Love the vase (what a find) and your beautiful flowers. 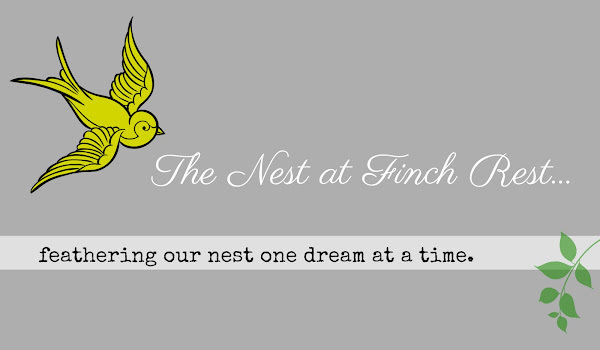 PS.. Now following your blog, would love it if you can follow back, thanks! What a peaceful and lovely spot. Your flowers are gorgeous! 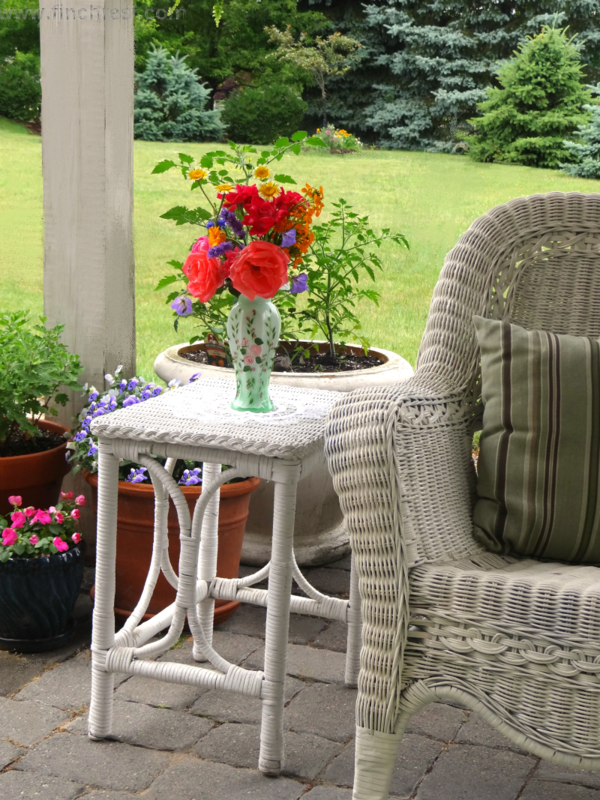 Love your wicker furniture, and the flowers are really pretty. I'll bet you really enjoy sitting out there enjoying the day! 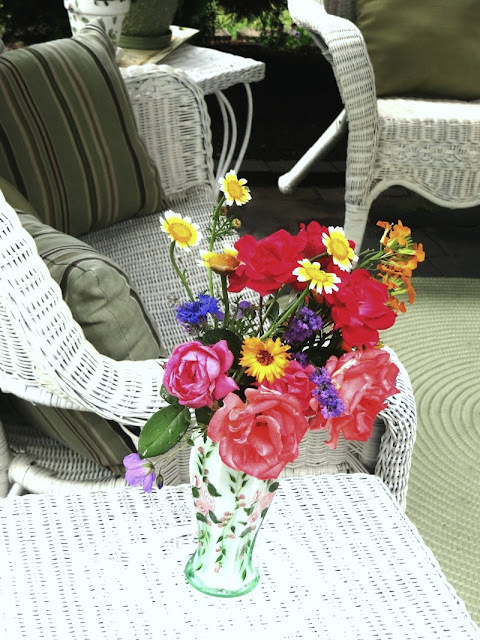 Beautiful flowers in your cute vase. I love how you mixed a little purple in it too. I so love white wicker and yours is perfect on your covered porch. Hope you set out there and enjoy the view. That vase is amazing and is a great addition to a center piece anywhere. Michele, your flowers are amazing! That first photo is so beautiful - it almost doesn't look real! I'm glad you enjoyed my post on Lake Erie and the lighthouse. I'll have to visit your sister's pub next time! I can imagine how much you miss being by the water. I've thought of moving up there sometimes. Thanks for sharing your awesome garden. The flowers and vase are truly beautiful. I love that you call your covered porch the "Zen" room. It really looks like a space where I'd feel Zen! I am so jealous that you can pick all those beauty flowers from your garden! Such a lovely bouquet! Thank you for sharing at TTF and have a great day!